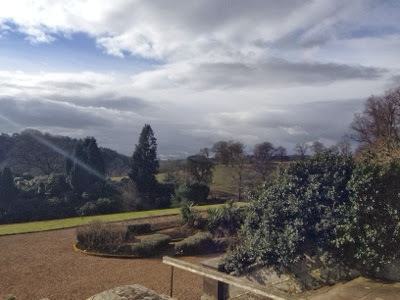 Despite being on our doorstep, we have never paid Belsay Hall a visit. This is mostly because they tend to have their special events on at weekends when I am at work. I generally like to visit places when they have a special event on as you get better value for money. 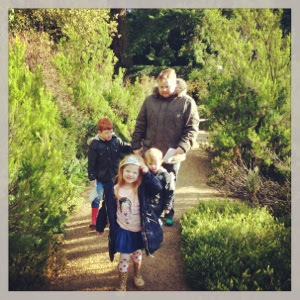 Anyway, they opened up this half term and were running a fairytale trail event everyday which I knew was something my children would enjoy. A family ticket to Belsay hall is £20.50 (2 adults and 3 children) or entrance is free if you are English heritage members. Please check the English Heritage website for opening times and up to date prices. 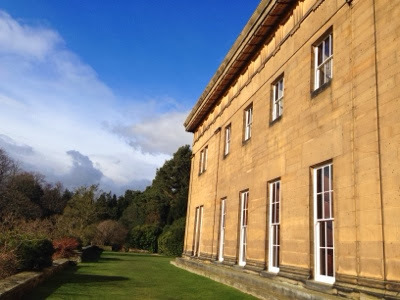 Parking is free at Belsay hall and you purchase tickets in the gift shop. The staff were very friendly and handed all of our children a fairytale trail sheet and pencil. They then gave us a map and have a few pointers of where to explore. 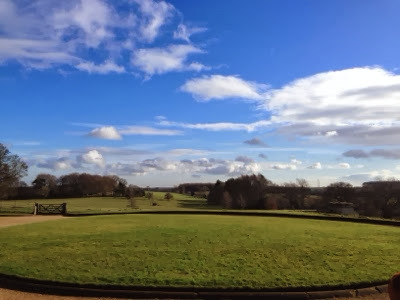 The grounds of Belsay hall are truly beautiful. Our children raced through them to try and find the answer to the first clue on their sheet. You can just about make out the pink plaque on the gate which helped us with our first question asking how many bowls of porridge the three bears had. 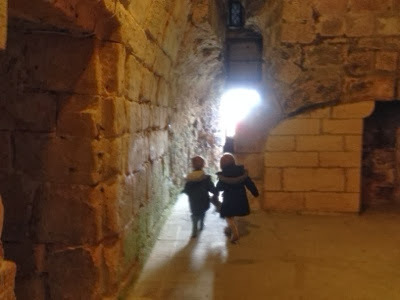 Next, we explored the hall which features some amazing architecture. The rooms are huge and the whole building has a very grand feeling. 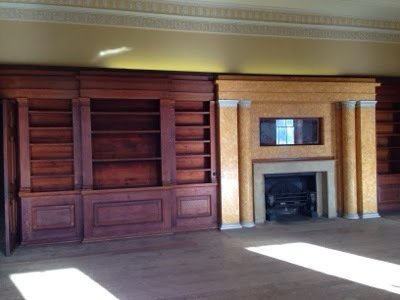 I loved the library where the walls were lined with bookshelves. 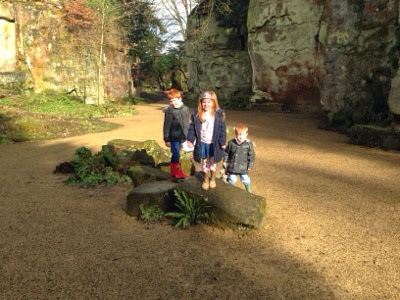 In hunt of more clues, we ventured into the Quarry gardens next which feature lots of beautiful wildlife and have been very well cared for over the years. 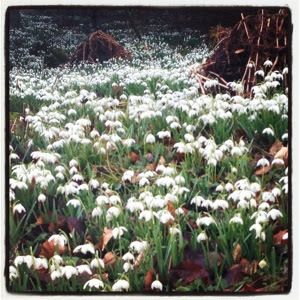 We spotted lots of snowdrops on our walk which was lovely. 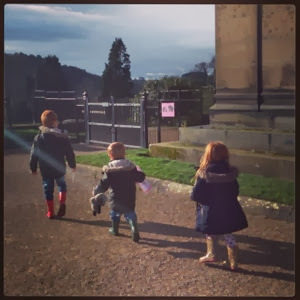 We followed the signs and completed more clues on our trail - the children were having a great time running ahead to find the next clue while the grown ups strolled behind and took in the scenery. 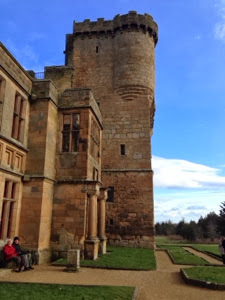 At the end of our walk through the wooded gardens we spotted Belsay castle which is much more of a ruin than the hall but still worth a look around. 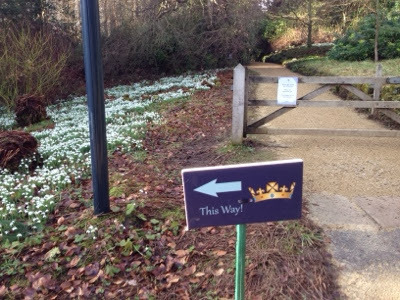 The fairytale trail was fantastic fun and a great way to ensure we walked around the main parts of the attraction. Our 3 year old just about managed it, but younger children may need a buggy or carrier. We walked back through the woods - stopping to look in a few little caves and climb on some rocks. 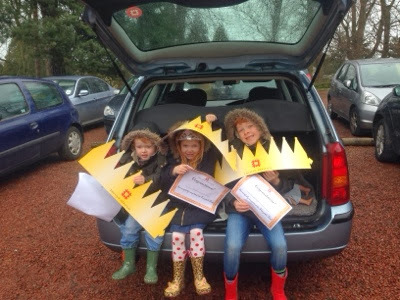 We handed our completed fairytale trail into the staff at the shop and were rewarded not only with a certificate but also with a crown each to make. This was all included in the admission fee. I had 3 happy children as you can see. We had built up an appetite with all that walking so decided to pay the tearooms a visit before leaving. 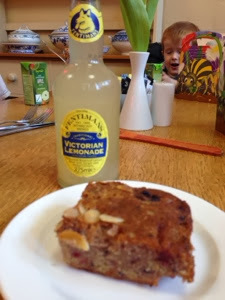 The tearooms are a foodies paradise - about 15 types of homemade cakes (with some unusual or rare flavour combinations), homemade soup and scones and stottie sandwiches all feature heavily. 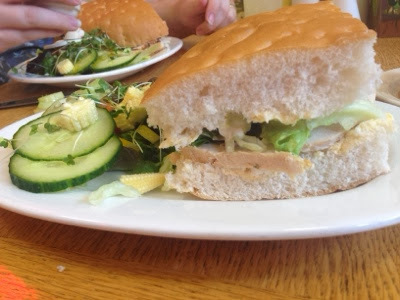 I decided on a lemon thyme chicken stottie and hubby opted for the more traditional ham and pease pudding stottie which were both served with a dressed side salad. We both ordered a drink and a slice of cherry and blackcurrant cake. Everything was fresh and delicious. Next time we visit we have our eye on the soup and scone deal (all homemade) or the cream tea deal. 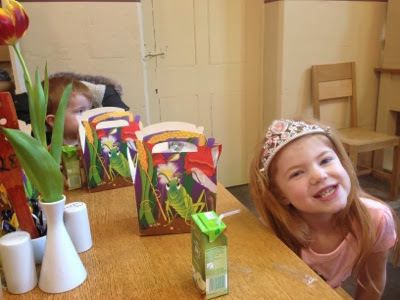 We ordered the children a children's lunch box deal - you could choose a ham, cheese or jam sandwich, a piece of fruit, a bag of crisps, a biscuit and a carton of fresh juice for £4 which I thought was a good deal and the children enjoyed it. Our lunch was £28 which is about average for a family of 5. 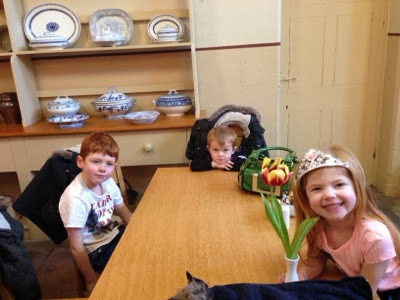 The tearoom is definitely worth a visit. 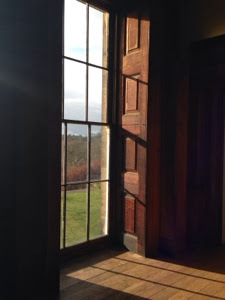 I am so pleased we finally paid Belsay Hall a visit. 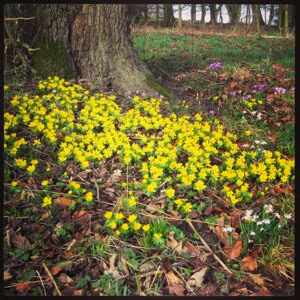 We all had a lovely time and are already planning to visit again in Spring to see all of the wonderful floweres in bloom.